So you’re staying in a big hotel, you forgot to buy a bottle of water and thirst has gotten the better of you. There is no complimentary water left, so you do what we all do… You look at the tap or faucet in the bathroom and think…..
There’s no 100% correct answer but you would hope that any large hotel water would be drinkable. But there really is no guarantee. Water quality may vary from country to country and you should always be very careful with hotel tap water in a different country than your own. Not necessarily because there may be bugs or germs in the faucet water, but rather because the mineral content may be very different to what your stomach is used to. Different water can have unpleasant side-effects up to and including diarrhoea. Check and see if there is a hotel welcome pack, leaflet or brochure, this might tell you if the bathroom water is drinkable. If you are in your own country with water that you are used to, at least to give yourself the best chance, let the bathroom tap or faucet run for a couple of minutes before filling a glass with water. I know this is very wasteful but you’re hopefull only doing this as a one-off, and you want to try to make sure it is the cleanest possible water you’ll be drinking. 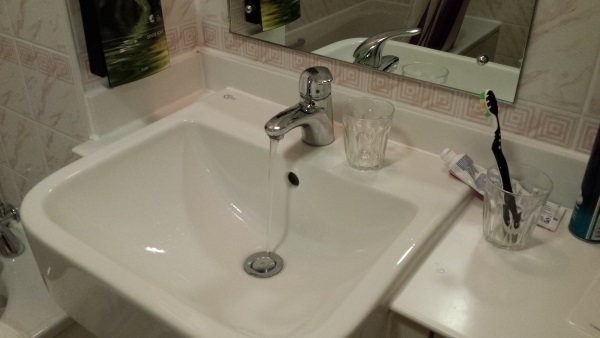 If in doubt, you can always phone down to hotel reception and ask them if the hotel bathroom tap water is drinkable. If you are in a foreign country, maybe avoid the bathroom tap water altogether and stick to the bottled water. You can usually buy a gallon of water for very little money.